On "The Lost City of Z"
In the films of James Gray, nothing comes easy. Survival is often sought at a high price. Walloped in deep shadow.... or inky blacks of a midnight trainyard.... or the halcyon golden of a cramped New York City tenement... or especially in the oppressive and humid jungles of South America, his films are a litmus test for the human experience. 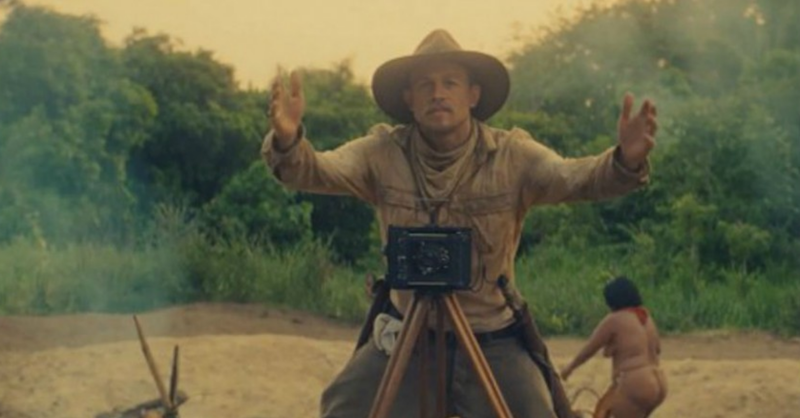 In his latest film, "The Lost City of Z" (adapted from the book of the same name by David Grann), his survivalist instinct manifests itself in a literal uncharted adventure that sees British officer Col. Percy Fawcett braving the depths of the Amazonian jungle and getting lost both in body and spirit. Gorgeously framed and edited, impeccably acted and featuring a classicism whose power is often overwhelming, I find it hard to believe Gray can ever top himself after seeing one of his films. "The Immigrant" (2014), though it bombed theatrically and at festivals, was a masterpiece of fragility and trapped emotions in the visage of Marion Cotillard's single immigrant female status. I love that film with no bounds. And now, "The Lost City of Z" has made me love something even more rabidly. As Col. Fawcett, Charlie Hunnam plays the explorer with a glacial muscularity, rarely belying the fear or apprehension he has with each successive visit to the Amazon jungle. Initially sent there to map out the terrain for a British geographical society, he begins to hear whispers of a lost magical city. He does see clues- pottery and elaborately carved statues of rocks- that are revealed to him like glimmers from God above before they're tragically taken away from him, either through natural causes or weak willed human stupidity. Three visits to the jungle in all, the final embarked upon with his growing son that has disastrous consequences Also along for most of the ride is his exacting aide, Henry Costin (played to perfection by a quiet, interior Robert Pattinson). Together, the duo represent explorers with intelligence, wit and careful consideration of their unknown surroundings. Dotted with Rudyard Kipling or Robert Louis Stevenson anecdotes of native violence- one in which features a nasty spill into a piranha infest river- Gray overrides these random conflicts of culture with more fraternal moments, such as when one of the population the explorers meet drops a colored liquid into the water and fish slowly pop to the surface, allowing him to grab a few for supper. In seconds, the fish resume their underwater crawl, causing Costin to remark how amazing it is for these people to only take what they need and nothing more. It's these moments of gentle observation that feel so true and educational that sets "The Lost City of Z" apart from other films of its ilk. More low-key than any standard Hollywood production, its a film whose beauty is unassuming and it sneaks up on you. Part of that sneaking beauty lies also in the performance of Sienna Miller as Fawcett's dutiful and understanding wife. Left at home with their kids... more years apart than together it seems.... her role as Nina stands out among the boy crew. Soft when necessary and strikingly hard when pressed, Gray chooses to end the film focusing on her. It's a brave move. After spending so much time with Fawcett and his compulsive trips to the jungle in search of a possibly imaginative place, Nina becomes just as lost and mentally forlorn as her husband. Wandering off into an imagined jungle of her own, Gray seems to be saying that the greatest sacrifice was not the adventure itself, but the person who allowed the adventurer to test the fate of an unforgiving environment at the expense of his loved ones. It's a sobering idea and yet another achingly perfect finale to a James Gray effort. In "Prometheus", director Ridley Scott began an ascension away from the original scare tactics of the "Alien Trilogy" and layered in origin ideas and the base for countless sequels to come. "Alien Covenant" continues this theory with some pretty batshit crazy acting from Michael Fassbender wrapped around some even crazier ideas of creationism, trans humanism and the floundering inability of space travelers to avoid danger. Essentially a haunted-house-pick-everyone-off slasher film (really, the franchise has been building towards this for 30 years, now its fully embraced it), "Alien Covenant" has its moments of near greatness but its ultimately a victim of that horror film trope of too many people we don't care about biting the dust. Add to that, quite frankly, the menace and freak show energy of the actual alien creature is reduced to a nimble CGI effect. If anything, the film shows us that a robot can be just as manipulative and evil as the very creature the franchise is named after. Maybe the next one installment will be called "David". Francois Ozon's "Frantz" is a beguiling effort that despite its arbitrary switching from shimmering black and white to bursts of color (that I still can't figure out why) genuinely grows as it winds along. Suffering from the loss of their youngest son in WWI, a German family's only consolation is the dutiful presence of the son's fiance played by Paula Beer. When Frenchman Adrian (Pierre Niney) appears, he slowly insinuates himself into the family, telling them he was a friend of Frantz in Germany. Of course, nothing is as it seems. Battling the disapproving glances of the whole town as well as the harsh nationalism and broken pride of their German defeat with a Frenchman in their midst, "Frantz" is quite the slow burn but whose mood and second half perspective shift makes for a consistently surprising effort from Ozon. Alain Corneua may be one of the more under appreciated French filmmakers of the last few decades. Working right up till his death in 2010 with the Kristin Scott Thomas/Ludivine Sagnier potboiler "Love Crime" (which spawned a fairly putrid DePalma remake in 2012 titled "Passion"), Corneau's real mean streak came in the mid to late 70's. Alongside the very bleak "Serie Noir" and hard nosed cop flick "Police Python 357", "France, Anonymous Society" was his feature film debut in 1974. In the spirit of all brash first attempts, Corneau runs rampant with idea, style and social commentary. The main idea, as such, is a complicated web of sardonic posturing between a local drug dealer (played to cool perfection by Michel Bouqet) and an omniscient drug corporation who seem to substitute for the government in political reach and power. One viewing may not be enough to fully comprehend exactly whose side each person resides with as the body toll mounts, kidnappings of silent little girls compounds the tensions and dead-end-bug-eyed junkies may eventually rule the world. And did I mention the whole thing takes place filtered through the immortal memory of the Bouqet character 100 years in the future? It seems all the violence did help discover some sort of immortal health injection, which creates even more of a loopy and dazed tension to the entire film. 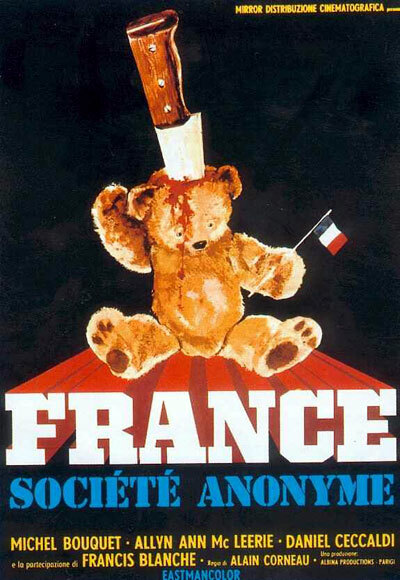 I'd say "France, Anonymous Society" is ripe for "rediscovery and release", but seeing as how its never been released on home video outside a now long out of print 10 film boxset, it's simply due for "discovery". See this if you can. It's been one of my unmitigated joys of the early year so far.